The M2-F3 is launched from the B-52 Mothership in 1971. 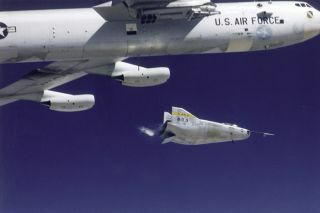 In this historical photo from the U.S. space agency, the M2-F3 lifting body is being launched from NASA's B- 52 mothership at the NASA Flight Research Center (FRC — now the Dryden Flight Research Center), Edwards, California. A fleet of lifting bodies flown at the FRC from 1963 to l975 demonstrated the ability of pilots to maneuver and safely land a wingless vehicle designed to fly back to Earth from space and be landed like an aircraft at a pre-determined site.